Classical Art Academy welcomes Anastasia Pollard to our team of tutors. Anastasia Pollard, accepted as one of the top Classical Atelier Tutors in the UK, has successfully exhibited at the London BP Portrait Awards in years 2006, 2007, 2009, 2012 & 2017. We are excited to announce that Anastasia is leading a three day portrait workshop (from a live model ) at the Classical Art Academy studios in Southbourne from Thursday 6th through to Saturday 8th September 2018. In addition to this initial workshop Anastasia will be running a second three day workshop in December 2018 and will be tutoring at the Classical Art Academy every Friday starting from September 2018 onwards. Classical Art academy have just launched our Art Mini Break courses for beginners and artist alike. We have a selection of two and three day courses beginning with Classical Drawing progressing to still life, landscapes, seascapes and portraiture. All of our mini breaks include B&B accommodation. For more detailed information please visit the Courses / Art Mini Breaks section of our website. Classical techniques for drawing in proportion, line and mass. Course dates are flexible and run throughout the week Tuesday to Saturday ongoing every month the year. We will contact you after we receive your booking to discuss what dates you would like to be booked into. This course is suitable for beginners as well as more experienced artists looking for classical drawing tuition. You will learn classical drawing techniques that date back to the ancient Greeks and were still in use by master artists throughout the Renaissance. You will spend two days with our regular students learning drawing methods that focus on proportion, line and mass to produce a selection of chiaroscuro drawings to take home at the end of the course. No previous experience in drawing is required. All course materials together with two night B&B is all included within the course fees. The our successful summer En Plein Air courses are about to start again see the calendar for details. This programme has enabled students to paint in oils on location in a variety of Dorset beauty spots. 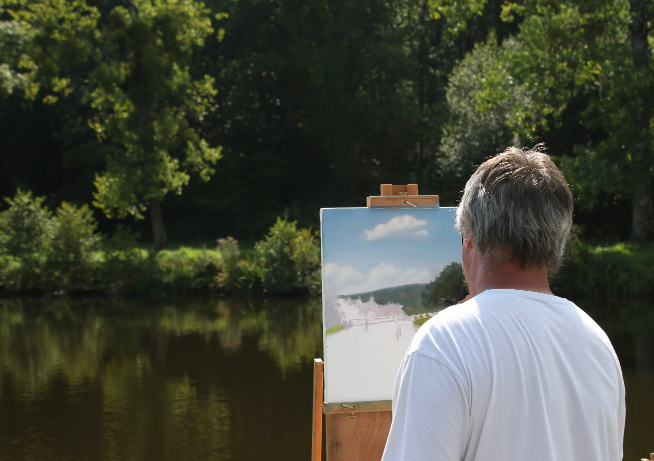 They are designed for all levels of ability and offer hands-on tuition with our experienced teacher Martin Close who will guide you through the key points of capturing nature on the canvas from life.